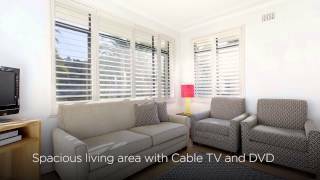 Ballantyne at Mosman Serviced Apartments are situated amidst the prestigious yet relaxed village atmosphere of Mosman - just a short drive north of Sydney's city centre. Ballantyne at Mosman Serviced Apartments are modern and spacious and offer the perfect getaway, the balance between comfort, convenience and value is their focus. Having travelled extensively and experienced many different forms of accommodation they ensure that Ballantyne at Mosman is the optimal level of accommodation for all occasions - It really is your home away from home. Relax and unwind in their self-contained one bedroom or studio apartments with reverse cycle air-conditioning, a fully equipped kitchen and an internal laundry, cable television, complimentary high speed wi-fi access. All apartments have a private bathroom with a hairdryer and free toiletries. Also features a private tranquil garden. Ballantyne at Mosman is conveniently located in one of Australia's premier suburbs with an unmatched setting on Sydney Harbour. Mosman is home to the world famous Taronga Zoo just a three minute drive, Balmoral Beach five minutes and Sydney Central Business District 15 minutes.